Replacing your HD800 cable with the immaculate quality of the Trebuchet offers an effortless improvement in sound. The HD800 cable includes the upgraded rhodium-plated Furutech FT-H800 (R) as default, as I've found the generic connectors to not be consistent in quality. Need something a little different or have questions? Please feel free contact me, I enjoy conversations with other audio enthusiasts. The Trebuchet offers an ultra flexible, hand braided litz of stranded 99.99997% pure ohno continuous large crystal cast copper wire (UP-OCC) in an attractive clear dielectric. 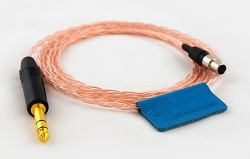 This unique wire is custom made for Zynsonix Audio, you won't find it anywhere else. Featuring an optimal strand count that delivers exquisite detail and neutrality, it's perfect for headphones, home and portable cables.